Air Canada hosted the chief executives of more than 20 Star Alliance member airlines today in Vancouver for the annual Star Alliance strategy meeting. 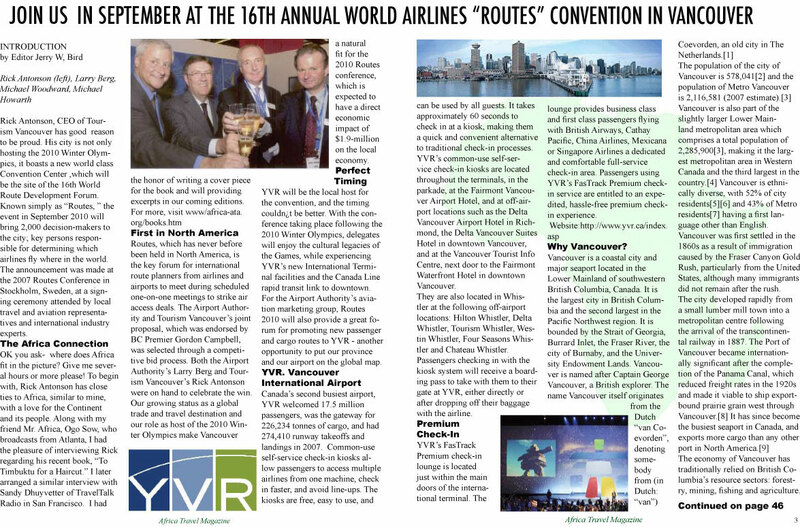 The event marked the 15th anniversary of the world's first and most comprehensive airline alliance, founded by Air Canada, Lufthansa, Scandinavian Airlines, THAI and United Airlines in 1997. The alliance now encompasses 25 of the world's leading airlines. "We are pleased to host the chief executives of our Star Alliance partners in Vancouver for this annual forum to discuss the strategy for Star Alliance going forward," said Calin Rovinescu, President and Chief Executive Officer of Air Canada. "Star Alliance was founded on the principle of offering customers the reach of a global network beyond what any single carrier is able to do on its own, and rewarding our respective customers' loyalty by providing reciprocal privileges across the world's leading airlines. Working together to meet our customers' international travel needs has become our hallmark, one that we continue to build as we look for ways to simplify our customers' travel experience and earn their loyalty." Mark Schwab, CEO of Star Alliance, said: "While modern technology has greatly improved global communications in the business world, the feedback we receive from our customers confirms our own belief that face-to-face meetings will never be replaced by 'virtual' ones. These regular meetings of our top executives ensure that our strategy continues to meet the changing needs of our customers, even as Star Alliance itself celebrates its 15th anniversary year." Avianca-TACA, Copa Airlines, EVA Air and Shenzhen Airlines have been announced as future members. The Comox Valley Airport has been named one of the world�s most effective rebrands in the eighth annual REBRAND 100� Global Awards. This award is the highest recognition for excellence in brand repositioning, and is the first and most-respected global program of its kind. �Many projects had big ideas expressed elegantly through all methods of engagement�language, visuals, sound, etc.� said Shashi Caan, Founding Principal, The Collective US and UK and 2012 juror. Each year, an international and multidisciplinary mix of industry experts convenes to jury this annual competition. They consider �before� and �after� representations of brand transformations with written summaries and supporting elements that showcase integration of social media and mobile engagement. The Comox Valley Airport�s corporate rebrand was launched in July 2011 and embodies its world-class service and local charm, bringing to life the unique stories of travelers to the area. The brand which has received Merit level recognition as one of the top 100 global rebrands, now serves as a platform for all marketing and communications activities for the airport. A small consulting firm or brand had as much opportunity to be selected as did global organizations with exponentially greater budgets since the name and size of the brand strategists are hidden from jurors during their review process. Emphasis was on executed strategy that made an emotional connection and met the stated objectives and needs of the identified target audience and prospects. Wile says YQQ has now successfully incorporated its brand into all aspects of its operations from its strategic marketing campaign, signage, staff and volunteer uniforms, to the overall look and feel of the terminal building and the corporate materials used to conduct its business. The 2012 REBRAND winners represented over 28 countries and 34 industries. They ranged from Dubai Airports, One Foundation from Global Ethics Ltd, Pfizer, National Music Centre of Canada, Merck Millipore, and Cisco. In addition to in-house teams, small agencies, and representatives of multinational corporations and non-profits, competing firms included Interbrand, SNK, Lippincott, Siegel+Gale, and Brandient. The Comox Valley Airport is centrally located on the central east coast of Vancouver Island and serves a population base of nearly 320,000 residents. It is the second largest airport on Vancouver Island and processed 308,937 passengers in 2011. Offering friendly, personalized service and year-round direct flights to Calgary, Edmonton and Vancouver, YQQ also provides seasonal chartered flights for Vancouver Island residents direct from Comox to Cancun and Puerto Vallarta. With the ability to access numerous domestic and international destinations through our airlines and their partners, YQQ is the best and most convenient entry point into central Vancouver Island. REBRAND� is the world's leading resource for effective brand transformations. The REBRAND 100 Global Awards is the first and most respected recognition for repositioned brands. Featured in such media as The Wall Street Journal, CNN Money, Bloomberg Businessweek, various magazines and books, the annual competition has entry deadlines in late September. The full 2012 winners showcase is at www.rebrand.com.